Lock in a great price for Casas de Outeiro – rated 9.5 by recent guests! Location is convenient, right by the Camino arriving into the city. The place is beautiful! 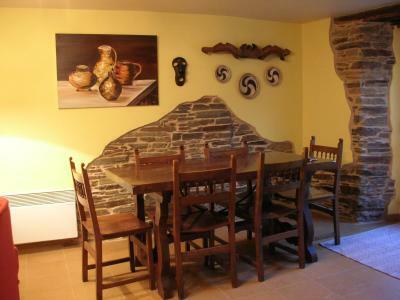 Lovely apartment, with modern comfort in a traditional and warm style. Spacious and comfortable. We really enjoyed it! Several lovingly restored accommodations. Classy and charming decor. Very spacious and comfortable rooms. Angel, the manager, was very helpful. This was the most adorable Casa! We absolutely loved our stay here and wished we had spent another rest day here. It was beautiful accommodations - recently renovated - and well maintained - the best bang for your buck here! The hosts were also super - they followed up with JacoTrans when our bags hadn’t arrived, and they did our laundry for us (for free)! Super friendly with the sweetest little family. Would recommend this highly! GORGEOUS place with huge room and bathroom, clean, big well equipped kitchen and living room with smart tv (and netflix! ), a five star experience!!! Best night of sleep. Very quiet and comfortable. Also has a washing machine in the kitchen. Very pleasant gentleman checked us in and provided lots of information. Room was first class, very clean and modern accommodation. Would not hesitate to recommend. They will do laundry for you if requested. Samos is lovely, well worth the extra km when walking the Camino. Loved this townhouse in Samos! 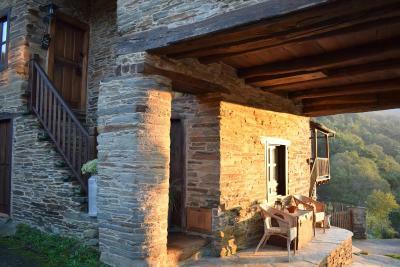 We spent two nights here in order to have a rest day while walking the Camino de Santiago. The townhouse was perfect. Ther bedrooms are large with lovely linens and the kitchen is large, modern and well equipped. Great appliances. A wonderful place to rest for a day or two. They are also affiliated with a Spa which I hear is wonderful. My companions have requested that I reserve again for next year! The hosts are so nice and hospitality. They're so willing to help and take care of you. And the room is so great and clean. Everything is perfect. Outstanding townhouse in a spectacular location. Close to monestery and beautiful views. Great Thai massage! Casas de Outeiro is located in Samos, 800 feet from the town center. Barbecue facilities, a terrace and free parking are available. All rooms are heated and include a private bathroom with a shower. There is a shared kitchen with a microwave and a refrigerator. Other facilities offered at the property include a shared lounge with TV, a tour desk and luggage storage. There are also spa facilities, to be used upon request. 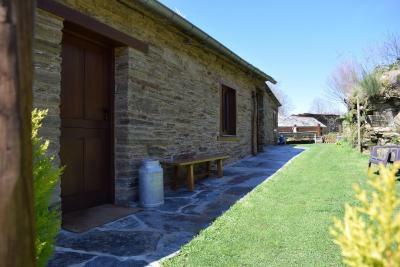 The property is located on El Camino de Santiago pilgrimage route and offers specific services and facilities for pilgrims. These services include bike storage, backpacks transfer and laundry service. An array of activities can be enjoyed on site or in the surroundings, including fishing and hiking. O Cebreiro is 22 mi from the property, while Serra do Courel is 16 mi away. This property is also rated for the best value in Samos! Guests are getting more for their money when compared to other properties in this city. 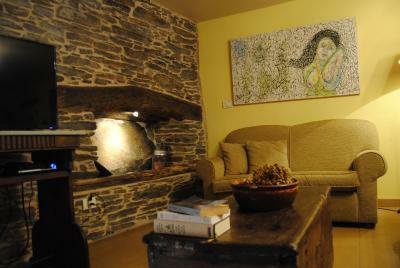 When would you like to stay at Casas de Outeiro? This house accommodates up to 4 people and features a fully-equipped kitchen, living room with TV, 1 spacious double room, 1 spacious twin room, and a bathroom in each room. There is also outdoor seating, heating and WiFi. This house accommodates up to 6 people and features a spacious living room with TV, a fully-equipped kitchen with stove and wood stove and direct access to a private patio with barbecue facilities. 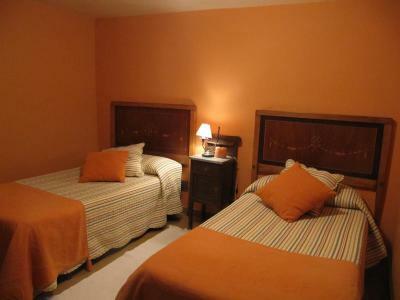 The house has 2 twin rooms, 1 double room with double bed and 2 bathrooms. There is also heating and WiFi. This spacious house accommodates up to 8 people and features a dining area suitable for 20 people and a fully-equipped kitchen. It has 4 bedrooms with bathroom. 2 bedrooms come with 2 single beds and the other 2 bedrooms come with double bed. This house also features a lounge with TV and garden with barbecue, heating and WiFi. This suite features a seating area with fireplace, TV and a small kitchen. There is a bed with soft cotton sheets in the same space, together with a large hot tub for 2 people. This suite also has a private garden, heating and WiFi. House Rules Casas de Outeiro takes special requests – add in the next step! Please inform Casas de Outeiro of your expected arrival time in advance. You can use the Special Requests box when booking, or contact the property directly using the contact details in your confirmation. The bed was not so comfortable. Missing small things like place to hang a towel. Beautiful room. Great bath. Loved the breakfast things left for us. Very nice place. There’s a bit of a hill to walk up from town but it’s also one of the reasons why it’s so peaceful and quiet so not complaining. They were very helpful and accommodating. Absolutely lovely house. Best night sleep I’ve had in days. This is an outstanding property. An ultra modern conversion of existing buildings. Everything you could wish to find is here, including a well stocked kitchen store cupboard. 5 euros for laundry. I wish that I could live here. A very nice place, the spa is small but comfortable (ask 24h in advance if you want to use it!!! ), the staff is very nice and the overall experience was great. Highly recommended in Samos. Lovely property. We ended up with the whole place to ourselves. But even if not, beautiful spacious room. Uphill from the town. Owner offered ride to restaurant in town. Downhill to town, uphill back to this Casa - not a problem, just for awareness that this accommodation is not in the centre but also not far. Very helpful owner went out if her way to offset the error of the Booking.com app which failed to deliver her pit message about the spa access Much appreciated after 7-8 hours cycling there. Well appointed apartments with gorgeous view - it's up a steep driveway but worth it!